Created by Hanamint to be unforgettable, the Mayfair Counter Height Dining Collection is unique and ageless. 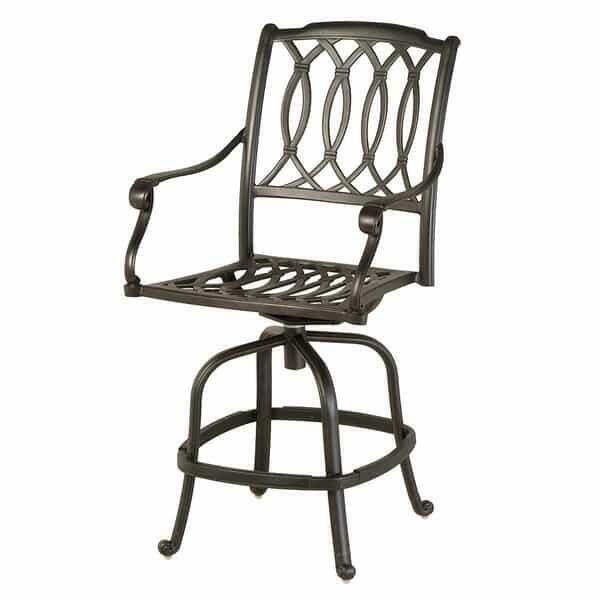 Hanamint starts with commercial-grade aluminum, submitting each chair and table to a complex finishing and powder-coating process that will protect your investment from rain, sleet and snow. This durability allows Hanamint to offer a ten-year warranty on this collection, one of the best in the outdoor furniture industry. And not only does the Desert Bronze powder coat protect the aluminum, but it provides a beautiful patina that is stylish yet understated. This counter height dining collection offers two tables that match the Mayfair counter height stools, with one offering a built-in Lazy Susan for your convenience. W 24.5" x D 19" x H 45.9" LBS 53 SEAT HEIGHT 25.3" ARM 34.4"
W54" x D54" x H37" LBS 61 LAZY SUSAN 24"
Swivel Counter Height Sto W24.5"xD19"xH45.9"